On November 25th, 2016, Israel was in the midst of a wave of arson attacks. One of the more memorable attacks was against the small hilltop community of Beit Meir. The news announced that the community was surrounded and endangered by several fires burning simultaneously on three sides. The pictures broadcast on the news were terrifying. The threat to lives and property were clear. Ultimately, the army was able to break through and get people out. But, devastation was left behind. Among those who lost so much, were Yoram and Meira Raanan. Yoram is an artist, his studio in Beit Meir was filled with painting after painting. Tragically, the arson attack on Beit Meir resulted in the loss of over 2,000 works of art created over a span of 40 years. How do you cope with such a devastating blow? What we are offered is the brilliance of thought that went into those years of work, even if we are denied the opportunity to see the paintings themselves. 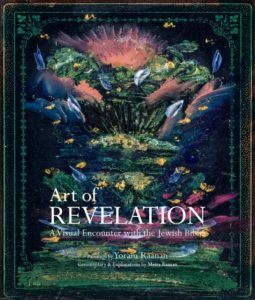 Ultimately, out of this tragedy, the couple produced the magnificent edition Art of Revelation – A Visual Encounter with the Jewish Bible. The book, published by Raanan Art Ltd.is a masterpiece of beauty in and of itself. 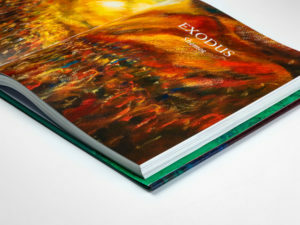 It offers full color, magnificent images of acrylic, oil and mixed media paintings related to the weekly Torah portions. The original paintings were creating during a three year period. Each picture relates to one impression that Yoram had in relation to that week’s Torah reading, as seen through the eyes of a talented painter. Adding another level of depth, each painting is accompanied by a brief insight into the thoughts of an artist as he transforms an empty canvas into the reality of his vision. More, the book reveals the artist’s techniques and discoveries. For example, in the painting “Crossing the Sea,” we learn how Yoram created the powerful waves of water. Brilliant shades of blues and greens combine to create depth and power within the parted sea as masses of people walk towards freedom. On a personal level, as someone who only recently began painting, this book amazed me. The images in the book opened my eyes to the beauty of acrylic paintings and has encouraged me to begin experimenting. More, I have to date not attempted to do more than copy magnificent landscapes (and stills). As an example, when I paint, it is with colors and shapes as they appear in the real life picture. For the first time since I started painting, I began to understand the freedom that a more abstract rendition of thought can provide. The flow of colors and design in this book transmit so much to the viewer. As a reader/viewer, I am left with the thought that each time I look through the pages of this book, there is more to be seen. This book would make an incredible gift for anyone who appreciates beauty. For someone just beginning to experiment, it offers a goal, a hope, and even a bit of a promise. No, I highly doubt I’ll ever come close to achieving Yoram’s brilliance, but as each image flows from page to page, it tempts me to try. The freedom of the colors await me, welcome me – as they do every reader. This beautiful edition has graced my coffee table in the living room for weeks and I have yet to tire from opening it and reading and simply looking. Already several people have asked me where they can get this book and I’ve sent them to Yoram Raanan’s website. Whether you paint or not, this book provides a stunning glimpse into the weekly reading of the Torah. More, it offers you a very clear path into the mind and soul of a very gifted artist as he shares his paintings (and his talented wife’s words). Paula, this man’s work is magnificent. Several years ago, before the fire, Hamodia featured Yoram’s work. His pictures told a story. After the fire, Yoram was once again interviewed by Hamodia. The grace in his words about the loss of his life’s work were accepting, not bitter.